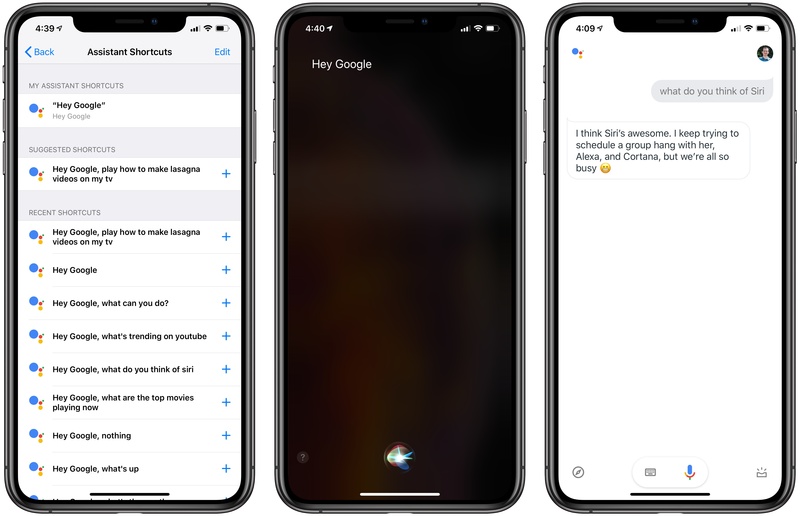 Google released an exciting update for its Assistant iOS app today, bringing support for Siri shortcuts and, for the first time, opening lines of communication between the two competing assistants. Siri and the Google Assistant have historically been unable to work together in any way, but thanks to the opening up of Siri via shortcuts in iOS 12, that changes now. With the latest update, you can set up a shortcut in iOS to immediately, via Siri, trigger any command you'd like to give Google's Assistant. The shortcut you'll want to set up immediately for the Assistant is one that simply launches the app and triggers its voice recognition. This shortcut will be available to set up as a suggestion in Settings, and if you'd like consistency with other Google devices, you can make your custom trigger phrase something like 'OK Google' or 'Hey Google.' That way, when you say the phrase via Siri the Assistant will launch and immediately start listening for your command – there's no extra step needed after triggering the Assistant via Siri, the app just opens and starts listening. I will note, however, that you can't run an Assistant-based shortcut while your device is locked. Beyond setting up a standard shortcut for triggering the Assistant, Google's app seems to donate every single command you give the Assistant as a shortcut option inside iOS' Settings. Because of this, for all requests you regularly make of the Assistant, you can set up individual shortcuts for each one, complete with their own custom trigger phrases. The limitation of needing your device unlocked means these shortcuts can't ever run in the background, but besides that drawback, the possibilities for integrating the Assistant with Siri are extremely broad now. Google unfortunately hasn't built any sort of settings screen into the Assistant app for getting started with shortcuts, but since every recent command you've made is available from Settings ⇾ Assistant ⇾ Siri & Search ⇾ Shortcuts, it's not a huge problem for those who know what they're doing. Google Assistant's adoption of Siri shortcuts is simply the latest evidence of what we already knew: that shortcuts is a game changer for Siri. No, shortcuts don't solve problems with the reliability of Apple's assistant, but it's pretty remarkable that I can now set up custom Siri phrases that trigger Google's own Assistant, and even specific Assistant requests. Maybe some day the app will be able to process those requests in the background, but for now at least, I'm content with what we have here. Google Assistant is available on the App Store.